Thank your for choosing TrustSoft AntiSpyware! 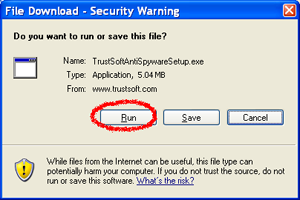 Click "Run" or "Open" to download and Install TrustSoft AntiSpyware. Click "Save" to start downloading then Click "Open" to Install TrustSoft AntiSpyware.